Merrion Row and it’s surrounding burrow have no shortage of eateries to choose from , however try dining on a Sunday evening and you’ll find your options much more limited as we discovered last Sunday when trying to book dinner for 8pm. Anyway a couple of phone calls later and a little debate Hugo’s got the nod. With so many fine restaurants in Dublin Hugo’s has escaped our radar so far, even with high praise from The Merrion Hotel’s Head Chef Ed Cooney. So we arrived to a packed, buzzy room on a Sunday, why more restaurants choose not to open we cannot fathom as this is such a vibrant part of town. We were quickly shown to our table and offered water straight away while we perused the impressive wine list. Hugo’s selection of good wine by the glass is reason alone to check this place out as not many bistros of this size can match that offering. We settled on a glass of Butterfly Ridge Reisling/Gerwurztraminer and a more subtle Esperanza Verdejo Viura. This is exactly why we love by the glass options – no compromise! Seating to the front of the restaurant which houses high tables, (which can be a pet hate of many) but in this instance were very comfortable apart from the abundance of cushions scattered behind us. Subtly moved to our neighbour’s table all was good. The menu is fairly varied with good starter options for most, from Beetroot Cured Shanagary Salmon to Slow Braised Pork Cheek. We were more swayed by the Crab, dressed in baby gem lettuce with zesty blood orange and a fine roast red pepper aioli. A light dish with an enjoyable creaminess to the crab. Being a total egg addict, himself could not be parted from the Coconut Spiced Cauliflower Tempura, dressed in hazelnut, orange and cauliflower purée with poached egg in the centre. Have to admit I was quite jealous I had not ordered this myself . Mains were a much more impressive affair. Although tempted by the Sea Bream , the Breast of Challans Duck proved too hard to resist. A tastefully presented plate of perfectly cooked duck arrived with a rich potato fondant, buttered long stemmed broccoli and the most exquisite carrot and star anise purée, nimbly dressed in a meade jus. The second main was a more hearty dish of Gluten Free Tortiglioni Pasta, a generous helping with squash velouté very much living up to it’s name with a velvety texture. Baby vegetables scattered throughout, small sprinkles of charming Cashel Blue cheese and a superb walnut and truffle oil topped off a fine plate. At this stage it was pretty clear that Head Chef Kieran Guilmartin has created a very varied menu and one that will definitely leave you wanting more. 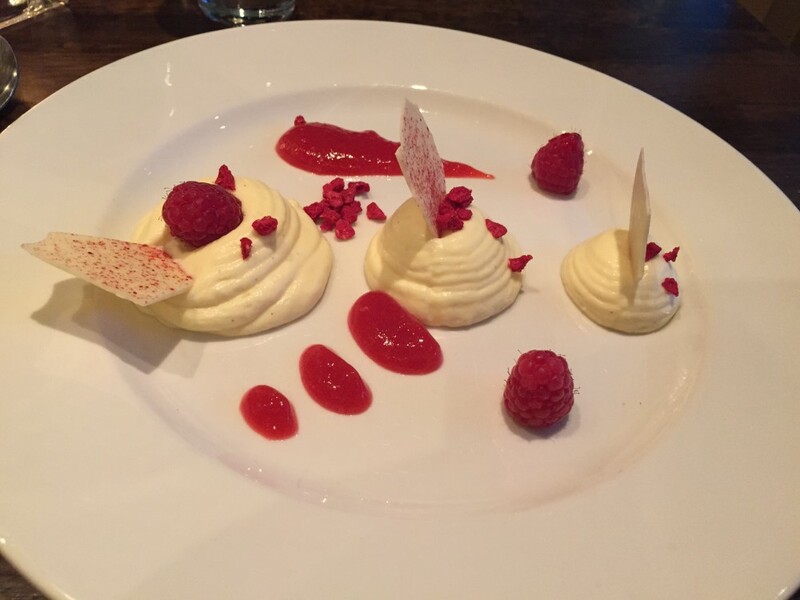 We shared a weightless dessert of White Chocolate Mousse, decorated with raspberry crispies, fresh raspberry and a chocolate tuile, the perfect ending to a throughly enjoyable dinner. After finishing off an excellent glass of Argentinian Malbec and chatting to our American neighbours at the next table, who were only in Dublin for one night and chose Hugo’s on the concierge’s recommendation, the general consensus was Hugo’s has all the right ingredients for a fabulous, fun night out. Our bill came to €116.65 including 4 glasses of wine and a large bottle of S.Pellagrino sparkling water. This is a Must Return Taste we highly recommend.